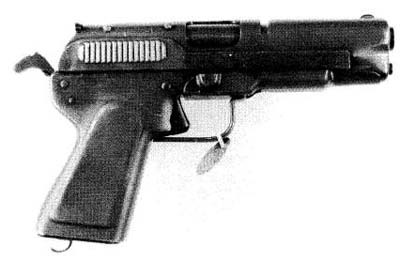 Pilot model based on the M1911A1 pistol but components such as frame, disconnector, trigger, and hammer were made from stampings welded or riveted together. Hammer spring was of a coil type similar to those used in a mouse trap. The rear sight rotated on its retaining rivet to act as a safety to prevent the hammer from striking the firing pin. The grip was adapted to accept the standard magazine for the M1911A1 .45 automatic pistol. Only pilot models of this design were produced.